There's no debate: Fritz Lang's Metropolis is the most influential science fiction film ever made. To watch it now is to constantly think, "Oh, so that’s where that came from." The sets, costumes, stories, and themes have inspired filmmakers, music videos, fashion designers, and architects, most of whom only saw a severely truncated version of the film yet were struck by it anyway. As with many sci-fi films, Metropolis' visuals are better than its story, but the story proved to be an archetype of the genre. Let's head deep, deep underground to learn more about one of Germany's most vital contributions to cinema. 1. THE FILM INSPIRED AN ECLECTIC LIST OF POP CULTURE CONTRIBUTIONS. Here’s a list of just a few of the things that were inspired by Metropolis: The design of C-3PO; The Matrix; the videos for Madonna's "Express Yourself," Whitney Houston's "Queen of the Night," and several Lady Gaga songs; Brazil; the futuristic cities of Blade Runner, Dark City, The Hudsucker Proxy, and Tim Burton's Batman films; and the wild-haired "mad scientists" of countless movies. 2. AT THE TIME, IT WAS THE MOST EXPENSIVE MOVIE EVER MADE. The budget of 1.5 million Reichsmarks eventually swelled to 5.3 million, which in 1926 was about $1.2 million. The film looks like it cost even more than that, with its huge sets and massive crowds of extras (though see below). But adjusted for inflation, that $1.2 million is only $16 million, or about one-tenth the cost of a large-scale sci-fi epic made today. Movies are a lot more expensive to make now than they were then. 3. PEOPLE HAVE EXAGGERATED JUST HOW HUGE IT WAS. 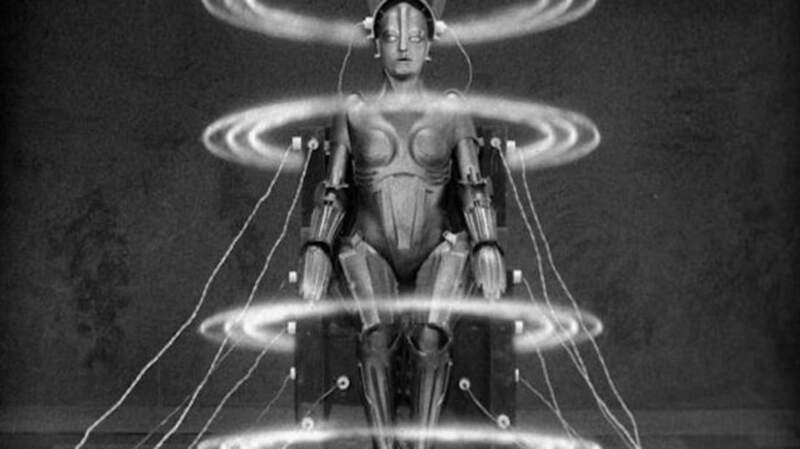 Articles about Metropolis often mention that Lang used "thousands of extras," with 36,000 being the number officially declared by the studio in publicity materials at the time. But according to Lang, that's nonsense. "There were never thousands of extras,” he said in 1971. “Never ... Two hundred and fifty, 300. It depends how you use a crowd." 4. IT INTRODUCED A TECHNIQUE THAT WAS STILL BEING USED AS RECENTLY AS THE LORD OF THE RINGS. Lang built some very large sets, but a lot of the visual effects he wanted required something even bigger. For those, his cinematographer and special effects guru, Eugen Schüfftan, adapted an old bit of stage trickery, using mirrors to "project" actors into miniature models or drawings. This came to be known as the Schüfftan Process and was used quite a bit over the next few decades until new technology came along that made it easier to get these effects. Still, it's not unheard of even today: Peter Jackson used the old trick in The Lord of the Rings: The Return of the King. 5. THERE IS PROBABLY NO ONE ALIVE WHO HAS SEEN THE WHOLE MOVIE. Metropolis was 153 minutes long when it premiered in Berlin in January 1927, longer than theater owners liked movies to be. When its box office performance was marginal at best, and with its distributor, Ufa, in financial trouble already, the studio made arrangements to sell the film and chop it up for foreign release. The butchered, almost incoherent version that played later that year in the UK and the U.S. was about 115 minutes long, followed by a re-release in 1936 that was only 91 minutes. Then, wouldn't you know it, the original version was lost. For 80 years, the only way you could see Metropolis was in one of those shortened forms, with various scenes occasionally rediscovered and re-added. In 2008, a battered negative of the original cut was found in Buenos Aires. It was painstakingly restored and issued on DVD and Blu-ray two years later, now 148 minutes but still not quite complete, as a few scenes were damaged beyond repair. (The restored version uses intertitles to explain what's in the missing footage.) So the only people who have ever seen the full, original, complete version were the Berliners who caught it in the first few months of 1927, nearly 90 years ago. 6. IT WAS INSPIRED BY THE REAL METROPOLIS. Lang visited New York City in 1924 and, in his own words, "I looked into the streets—the glaring lights and the tall buildings—and there I conceived Metropolis." Now, that's a bit of an exaggeration. Lang was already working on the Metropolis script with his wife, Thea von Harbou, when he visited the Big Apple, so the city wasn't what gave him the idea in the first place. But New York, and especially the Art Deco architectural style of the time, certainly influenced the visual design of the film. 7. LANG ALMOST GAVE SOME POOR KIDS HYPOTHERMIA. For the scene where the workers' city is flooded, Lang brought in some 500 children (note that that's more than the 250 to 300 extras he cited earlier) from Berlin's poorer districts and had them stand in a pool of water that was, in the words of one actor, "kept at quite a low temperature, to nip excessive demonstrations of our youthful gaiety in the bud." The sequence took 14 days to shoot. To his credit, Lang made sure the kids were well fed and cared for during those two weeks on the set, and he was no more indifferent toward them when the cameras were rolling than he was toward anyone else. 8. IT TOOK A YEAR TO FILM AND IT'S A WONDER NOBODY DIED. Lang was a meticulous, exacting filmmaker, often doing multiple takes for even uncomplicated scenes. By the time Lang spent two days getting a shot of Freder collapsing at Maria's feet, the actor playing Freder could barely stand up. In the scene where Maria is burned at the stake, the actress' dress caught fire. In the flooding sequence, he commanded extras to throw themselves at the jets of water, which were coming with fire hose force. 9. THE NOVEL AND THE MOVIE HAD A SYMBIOTIC RELATIONSHIP. 10. H.G. WELLS SAID IT WAS THE SILLIEST FILM HE'D EVER SEEN. The visionary sci-fi author's The Time Machine had inspired Metropolis' division into an upper world and an underworld, so it must have stung a bit when Wells hated the movie. He called it the "silliest film" he'd ever seen, saying it was wrong, "with a sort of malignant stupidity," about the direction society was headed. "Metropolis, in its forms and shapes, is already as a possibility a third of a century out of date," Wells wrote. 11. THE LEADING LADY'S MOM GOT HER THE PART. Brigitte Helm—born Brigitte Schittenhelm in 1906—acted in school plays but had no professional experience when, in 1924, her mother sent her photo to Fritz Lang, hoping he might cast her in a film. Lang gave young Brigitte a screen test, which she charmingly described in the printed program for Metropolis: "Someone gave me a letter to read, and while doing this, the lights were switched on, and the cameraman turned the handle. The great moment had come. I was being filmed! Then an actor approached me unexpectedly, and in a loud thrilling voice insulted me. Afterwards I heard that this incident was necessary, as Mr. Lang wanted to test my expression." Lang liked what he saw and cast 18-year-old Brigitte as the female lead. 12. IT WAS A FLOP AT THE TIME, AND FOR REASONS THAT WILL SOUND VERY FAMILIAR.